Happy Tuesday everyone! Today marks the first in yet another brand new series as part of the new, revamped Under the Vintage Veil. We’re very, very lucky to have an expert contributor for this feature. You probably already know her from around the vintage scene, she’s an award-winning stylist and owner of The Little Wedding Helper, Kirsten Butler! Crockery can be a beautiful way to add even more delicate floral touches to your table settings, incorporate a gorgeous pattern or colour scheme, and best of all they’re a practical item so you’re not over loading your day with objects you won’t use. One of my past couples used mismatched plates to enhance their romantic theme, and as these photos by Sam Gibson show you, it worked perfectly. Something I particularly loved about the day was the way the beautiful centrepieces (The Wild Bunch) picked out the colours and intricate patterns of the table wear. Sara (the editor of Under the Vintage Veil) also used plates in this way at her own wedding back in August, topping them with delicate doilies as place settings to complement her florals and lace theme. At some weddings you eat off them, at some you smash them (!!! ), but when is a plate not a plate? Well, when it’s a photo frame, wall art, a table plan, signage, or a table number. There are so many things we can do with tableware that takes it off the table and transforms your venue. 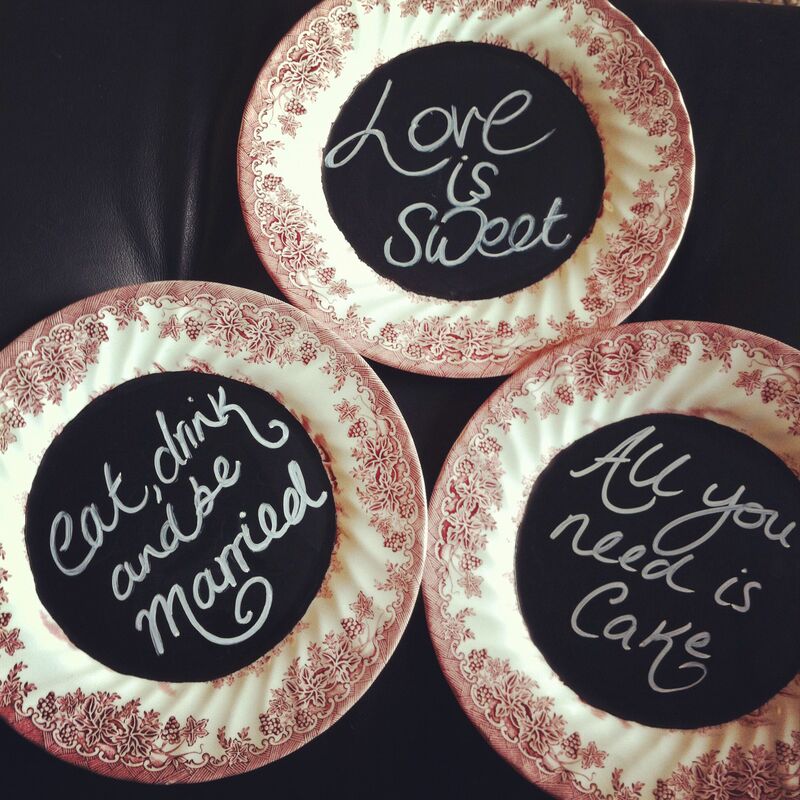 I’m particularly in love with the idea of using chalkboard paint to turn your plates into signage. Or, using transfers, adding a personal touch to a table or wall display by transferring photos of loved ones or a favourite quote (there are companies that will convert images into an enamel transfer sheet for you). Otherwise ideas include writing on the plates yourself with a gold marker, glueing a metal door number to plate to create a gorgeous table number, and if you’re hanging plates and don’t have a Granny to pinch the wall mounts from most hardware shops will stock these, as well as John Lewis. However you choose to use plates for your big day, there are plenty of places to source them. If you’d like to use them as tableware, there are many fabulous vintage hire companies (see the Very Vintage Directory to find one in your area) and if you’d like to do a little DIY, you can find fantastic bargains at car boot sales and in charity shops. Are you using vintage china plates for your big day? Are you doing something a bit different? We’d love to hear from you!